My first foray into horseradish sauce happened as a result of conversation with my son's piano teacher, Miss Betty. (Some of you may remember her from her rye bread and pickle recipes.) Betty and her husband have a huge patch of horseradish, but this year her husband said he didn't want to make homemade horseradish sauce because it was too much work. (They are getting up in years, so the digging and cleaning is becoming more of a chore.) Never one to miss an opportunity to learn to try something new in the kitchen, I told her that we'd be happy to give her a hand. After digging, we washed the worst of the mud off with a garden hose. Then we went back to our kitchen and did the peeling and chopping. Because we had so much horseradish, I placed the cubed horseradish in water with citric acid in it to prevent browning. You could also use salt water or water with lemon juice. 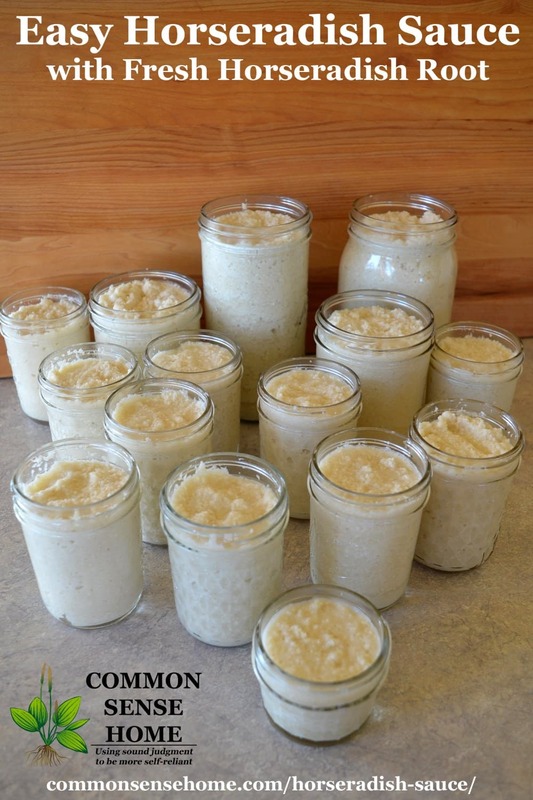 Betty and her husband normally work in small batches (1 cup of horseradish, as specified in the recipe), so they skip the anti-browning treatment. Betty shared her family's two horseradish sauce recipes with me – one basic pickled sauce, and one creamy sauce made with the basic sauce. You can use apple cider vinegar if you prefer, but it will give the sauce a darker color. Put all ingredients into a blender or food processor at high speed. Blend until creamy. Put in a jar and store in the refrigerator. Note: If you don't have a food processor or blender, grate the horseradish root as finely as possible and blend with other ingredients. 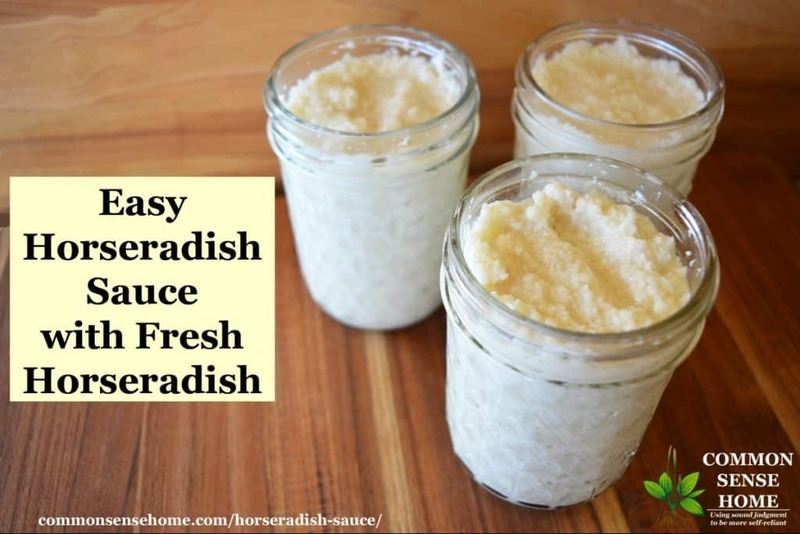 There is no USDA approved method for canning horseradish sauce. It may only be stored in the refrigerator or freezer. 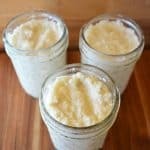 Simple recipes for homemade horseradish sauce – plain or cream style – made with fresh horseradish root and other quality ingredients. In a small bowl, blend all ingredients. Makes about 1 cup. Store in refrigerator. If you don’t have a food processor or blender, grate the horseradish root as finely as possible and blend with other ingredients for the basic sauce. Another simple use of the basic horseradish sauce it to mix it to taste with ketchup for a quick cocktail sauce. This is my sons' favorite way to eat horseradish. Betty and I were talking about how very few people make homemade horseradish sauce anymore, even when they have access to a horseradish patch. The big batch we did took a couple hours (with digging and cleaning), but we ended up with four quarts of sauce. (I'm gifting out horseradish to local friends and family this fall.) If you were making only a cup, it wouldn't take much time at all. I think that perhaps our modern palates are spoiled by the abundance of food choices available in the average grocery store, and how much fresh produce is available all year round. In the olden days, folks were more appreciative of the zip of horseradish when they had to rely on storage food all winter. The same might be said of heavy spiced cakes and cookies. I find when baking that spice cakes and cookies are much more appreciated by the older crowd, while young palates more commonly go for chocolate or vanilla. Be careful when working with the ground horseradish root! I could smell the vapors as we were chopping, but it wasn't until I leaned over the bowl of the food processor that the full effect hit me. My eyes started watering, my nose started running – I cleared sinuses that I didn't know I had. I had to step away for a moment and wipe the tears, and when I came back, I made sure to keep the sauce at arms' length. Horseradish and wasabi are both rooty members of the cabbage family, and they release a compound called allyl isothiocyanate, which is responsible for that pungent burn. The pungency will fade over time as the sauce sits in the fridge, but when it's fresh, watch out! 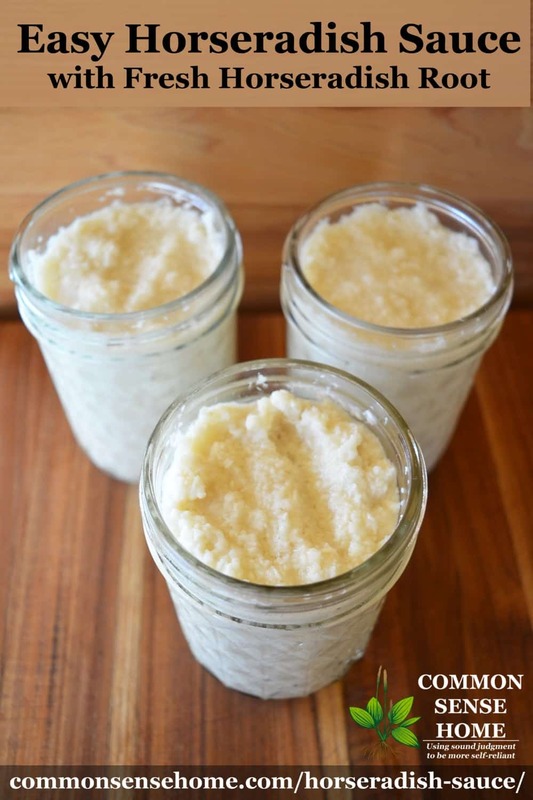 Have you ever tried homemade horseradish sauce? What do you think about the disappearance of spicy desserts? Share your thoughts below. This sounds yummy! I love the flavor of horseradish, but I’ve never tried processing it myself. How long does the sauce keep? Is it better to make a bunch at once, or does the root store well enough to make a new batch as you finish the old batch? Thanks! I’ve stored whole roots in the freezer for months and it hasn’t affected the taste or hotness when I’ve taken them out to use. I read somewhere ages ago that the roots only release their flavour when they’re chopped up or grated. Don’t know how true it is as I’ve only frozen whole roots. Given that the roots are very firm, and that I was able to see and breath just fine until we started grinding them, I would suspect that you’re correct. 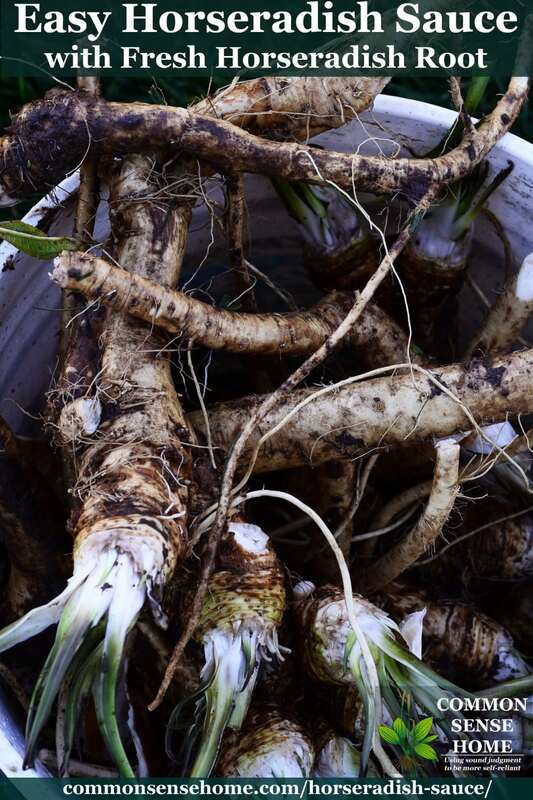 I store whole horseradish roots in the refrigerator for a year at a time. I peel and grate only what I need for immediate use. The key to making horseradish hot, and I mean HOT, people, is when to finish it off with the next ingredient — vinegar. Vinegar stabilizes the flavor and when you add it, will affect the spicy outcome. If you add the vinegar too soon, the horseradish will be milder in flavor. For “knock your socks off” spicy, be sure to wait three minutes before adding 2 to 3 tablespoons of (5% strength) white distilled vinegar and ½ teaspoon salt for each cup of grated root. That makes sense, as leaving onions and garlic sitting after chopping will also intensify the flavor. Try a bit of horseradish in ham and bean soup. Grandma suggested this and WOW it is excellent, give it a try. Grandma’s rule: only harvest horseradish in months that end with R.
Search – Horseradish superfood – more science will expand and confirm this, in my small opinion. I read that to keep your horseradish under control you were to only plant as much as you could eat in a year. I have horseradish and I love it. I am going to try to can 1 half cup jar this year. If it works then next year I will see if I can get my in-laws patch under control. I love the the old spices and try to grow as many of my own herbs and crush them when I need them. It makes such a big difference in flavor. The planting only as much as you need is a good theory, but can be hard to implement in real life. Any bit of root left behind can and usually will grow into a whole new plant. 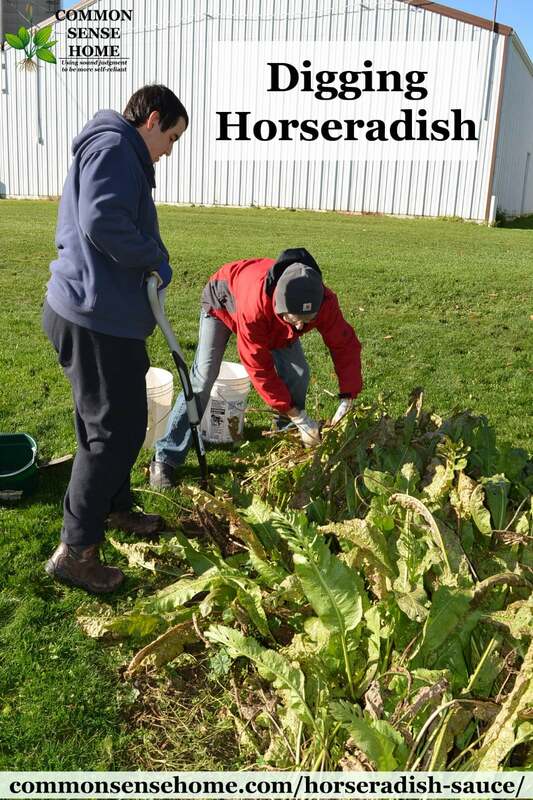 I’m sure the neighbors didn’t start with a 12 foot long patch of horseradish, but after numerous decades, they now could keep the whole township supplied. You are absolutely right on the flavor of fresh and properly preserved herbs versus most of what’s in the supermarkets. It’s like night and day. This sounds great! I love horseradish, but don’t always like the sauces I buy in the store. Great idea for making your own. I’ve never seen horseradish in the grocery store, but then again, I’ve never looked. I’m sure I can find it somewhere! Hi I live in Northern MN and there is a huge natural peat bog in an area where I live and a Wisconsin company comes and loads semi’s up with the horseradish root and takes them back to WI for processing. The name of the horseradish in the stores is called Silver Springs and it is an excellent product. You may not have it in your area but if you do it is very good. I do process my own when I can find the roots. The first time I made fresh horseradish sauce, I had to hold a towel over my face while I was processing it. The tears were streaming down my face! Now I take all my equipment, my food processor, and extension cord outside to my picnic table when making horseradish. I usually make about a dozen pints at a time because everyone in the family wants some. I made horse radish sauce today for the first time. I read, somewhere, that letting the shredded horse radish chill in the frig for 30 minutes before adding vinegar would maximize ‘heat’. So I tried that. We’ll see!!!! I know that letting garlic or onions sit, chopped, intensifies their flavor/odor, so it wouldn’t surprise me if the same thing works for horseradish. I take my food processor outside and set up my horseradish making on the picnic table. The first time I made horseradish, I was in the kitchen and the fumes were so strong I had tears streaming down my face. My husband thought it was hilarious! My family loves fresh horseradish! Nice to know that the roots can be kept in the refrigerator until you need them. We use an old fashion meat grinder for our horseradish and freeze it in small jars that I save during the year. One cup jelly jars work good also. We like a little on pizza. Mix it with ketchup for a good shrimp sauce. I never thought of horseradish on pizza. Thanks for the tip. Oh I forgot to mention dig horseradish in a month that has an R in it. Don’t know why but my Mom told me that years ago. So I only dig it up in the fall usually September. Yes, you don’t want to dig the roots during the growing season, because the plant pulls up energy out of the root for foliage. Thanks for the reply. I often wondered why the digging exclusions. But it makes sense like removing foliage of tulip bulbs etc…. I planted the crowns that I cut off the root so I can have my own patch. Love your website! For storing horseradish, my Granny always filled a deep long box with dry sand and buried the harvested roots in that. You then keep the box in a dry, cool, dark spot, like the basement or crawl. They keep very well right into the next harvest. We have ‘fresh’ roots all year that way. I tried this method last fall with a few roots and just looked at them the other I actually forgot about them and they were in pretty good shape, So this year I will put bigger size roots in the sand. Another question why does the ground up root that you froze lose allot of it’s heat when you defrost it? It’s basic food chemistry. The compounds in the root that make it hot react to air and start breaking down when you grind it. So if you grind it, freeze it, and thaw it, there’s a fair amount of time for that reaction to happen, and you lose heat. It would be better to freeze roots whole, or freeze the sauce with vinegar. The bite and aroma of the horseradish root are almost absent until it is grated or ground. During this process, as the root cells are crushed, isothiocyanates are released. Vinegar stops this reaction and stabilizes the flavor. For milder horseradish, vinegar is added immediately. Some folks say out of the kitchen when doing industrial quantities of this stuff, esp. around Easter time. Peel, chop and mix in the garage with the door open. It can get pretty toxic. I won’t probably ever make this, it is too easy to purchase prepared product for two people. I will note that real Wasabe is very expensive and what we buy reasonably in the supermarket for Wasabe is colored horse radish product. Not bad, just not real Wasabe. I love it all. My mouth is watering just typing this. I watched a video of one of the traditional wasabi makers – such time and care involved. If you’re only making for two people, you could whip it up quite fast with minimal discomfort. It was only as we worked through the bin of roots (and I leaned over the grinder) that things became more pungent. With freezer space limited, I dry a lot of produce. Last year I dried some of the extra root and then ground it to a powder in my spice grinder. I reconstitute it, in small batches, with white wine vinegar, add sugar and salt and voila! “Fresh” horseradish sauce. Pungent and great for adding to casseroles, etc. Is it extremely fragrant while drying, or not too bad?